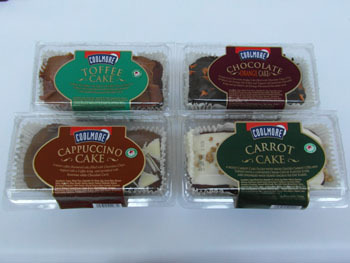 A range of moist, rich filled loaf cakes, topped with luxurious flavoured icing, supplied in an ingenious case to keep your cake fresh. Carrot – Carrot cake filled with fresh grated carrot, topped with cream cheese flavoured icing, and sprinkled with honey encrusted oat flakes. Chocolate Fudge – Chocolate fudge cake filled with chocolate chips and topped with chocolate icing and sprinkled with chocolate curls. Chocolate Orange – Chocolate fudge cake filled with chocolate chips and orange oil and topped with chocolate icing, sprinkled with orange flavoured chocolate curls. Lemon – Lemon cake filled with toffee pieces, topped with lemon icing and sprinkled with white chocolate curls. Toffee – Toffee cake filled with toffee pieces, topped with caramel icing and sprinkled with caramel flavoured chocolate curls. Cappuccino – Coffee cake filled with chocolate chips, topped with coffee icing and sprinkled with chocolate curls. Banoffee – banana cake filled with toffee pieces, topped with a caramel icing and sprinkled with luxurious caramel curls. Milk Chocolate – A vanilla cake filled with chocolate chips, topped with milk chocolate icing and sprinkled with luxurious milk chocolate curls. Hazlenut Brownie – A moist rich chocolate cake filled with nibbed hazlenuts, topped with luxurious chocolate icing and sprinkled with honey encrusted oat flakes. Spiced Fruit – A moist rich fruit cake filled with sultanas, cherries and mixed peel and topped with luxurious white icing. Spelt & Yoghurt range: A ancient wheat used from Roman times) This range has no icing on top of the cake. Banana & Walnut – A moist banana and walnut cake with a distinctive spelt nutty flavour. Spelt flour is of higher nutritional value compared to wheat flour and although containing gluten it may be tolerated by some with sensitivity to wheat gluten.